Lambdas: What are they and When to use them! A couple of weeks ago I created a basic rope physics system anticipating my group would be working on our Diamond Theif idea. However I arrived late to find that we were working on the Glider game. This week, while most of the team worked on Sprouter, a few members broke off to work on the Diamond Theif game, making use of my rope system to power the core mechanic. The rope was made by using Character Joints in unity to connect segments composed of capsules. The first capsule is made a kinematic to anchor the rope. Following rope sections are hooked up to the section proceeding it using the character joint. Note: You’ll need the unity web player. Use the A and D keys to avoid the traps as you are lowered down to the diamond. 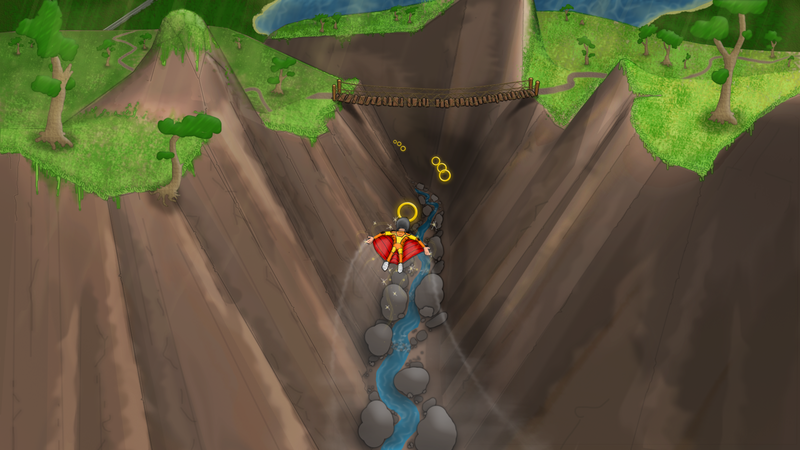 Try and collect coins on your way down. I spent this week working on a game called Sprouter. The idea is that you guide a seed from sprouting into a full-grown tree, controlling the growth of branches and roots and interacting with the surrounding environment. The prototype ended up quite different from the gameplay in the presentation. The problem was we (the programmers) could not work out to program the tree growth mechanic in unity in the 2 days available to us. In the end we created a system where you pressed a button on the seed or existing branch/root to create a new branch/root, you could then adjust its rotation as desired. Suffice to say this was a little forced and did not really capture the relaxed gameplay style we were after. We discussed the idea of having a game menu based on the seeds in an existing tree. You would start a new game by clicking on one of the seeds, at which point it would fall off starting a mini game where you had to land the seed in the best possible spot for future growth. the prototype includes a short scene demoing this idea. In the first scene you can use the W and S keys to control the height of the seed. It doesn’t really matter what you do here, as soon as the seed hits the ground you’ll begin the game proper. In the second scene you’ll need to grow roots to get water and minerials and branches to convert water to energy. Make sure you start by building at least one branch and one root. To build a branch or root click and hold one of the tan buttons on the seed. While still holding use the Q and W keys to rotate the branch/root to the desired angle. If you get stuck you can use the IOP keys to cheat. We had some trouble developing a functional movement system for this prototype. We tired applying a constant force and directly translating the player based on user input, however this didn’t feel right and allowed the player to go anywhere. the final system in the prototype is a monstrosity involving hooking the player up to two invisible games objects moving ‘on rails’ using springs (horrible!). The result was slow and sluggish, It didn’t feel like you were skydiving at all. The goal is to hit the big gray slab at the end of the canyon. Avoid obstacles by moving the character using the arrow keys. Flick Hazard was an idea devised by one of my group members while stewing over some of our game ideas from the first week of this Prototyping assignment. The basic premise is that you are a baby in a runaway pram going wildly down the street. The player has no control over the pram, instead they flick potential Hazards (cars, trucks, etc.) out of the way. The game would targeted at mobile platforms (phone/tablet) using touch for the flicks. Flick the cars out of the way. To start a flick hold down the left mouse button, move the cursor through the car and release to finish the flick. This is the first in a series of post I’m doing on my Game Prototyping assignment at college. We started out this week by brainstorming game ideas which we could later prototype. Blind Beware – Protect the blind character as he walks down the street by interacting with potential hazards around him. Hazardous Hen – Player controls a character whose aim is to dodge incoming vehicles on a busy road causing as many accidents as possible without getting harmed. One Armed Warrior – One armed warrior swings from a whip and can only shoot enemies when not swinging. Diamond Theif – Thief on a cable lowering towards diamond, player controls speed and swing to avoid traps and obstructions. Haunted to Death – Player controls a lonely ghost trying to haunt someone to death in order to gain a ghostly companion. Pick Axe Prison Break – Use your pickaxe to break through walls and make your escape, don’t break too many walls or the roof will collapse. Human Herding – Player controls a pack of zombies in order to herd humans to a desired location. Coral Reef – Strategically grow your coral against other plants and grow your territory. Spider Web – Play as a spider creating a web; eat or enslave your prey, repair any damage. Next week we’ll have to start taking these ideas and turn them into working game prototypes.